I don’t know about the rest of you, but I love Mexican food. LOVE it. Unfortunately, there are a few essential ingredients that are not very Paleo *sigh*. I’ve resigned myself to relegating Nacho’s to the ‘very rare treat’ box, you just can’t have Nacho’s without corn chips. They wouldn’t be Nachos. However, I did have a craving for enchilada’s recently and it occurred to me that perhaps I could find a Paleo tortilla. And I did! You can find the super simple recipe here. 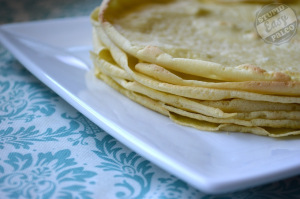 These tortilla’s can be sweet or savoury – you can have wraps or crepe’s, essentially. I did NOT make a crepe example, so I can only vouch for their suitability as a savoury wrap/tortilla. They use a little coconut flour and more arrowroot flour which holds them together nicely (I hate recipes for pancakes that result in crumbly, impossible to flip messes). They taste appropriately bland which to me is important if you are trying to make a tortilla. There’s no overwhelming egg flavour, no overly nutty flavour, nothing. It means that whatever you put in them is what you really taste…. #winning! They are easy to mix up and cook very well – they don’t really brown up too much but I’m ok with that. When cooked, they are nice and flexible so wrapping them around other ingredients is absolutely doable. They cook a little slower than a traditional crepe so that adds a bit of extra time to meal prep but nothing too major. One thing I will say is that the quantities given in the recipe only yielded me 3 x 6″ tortilla’s and one smaller one. I ended up making a double batch. But maybe mine ended up a little thick? I think I’ll try to thin out the batter a little more next time. So that’s the one negative I can report for this. These were great filled with chicken & enchilada sauce, topped with more sauce and cheese (not strictly paleo, I know – you could do without) and baked in the oven for 15 minutes. The tortilla’s still held together and were a perfect substitute! Yay for the return of (some) Mexican!